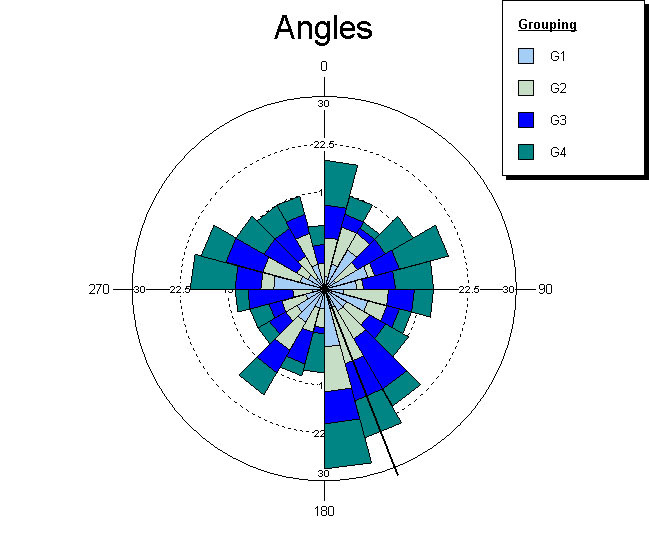 Oriana calculates a variety of single sample statistics as well as inter-sample comparisons. The basic statistics include the circular mean, length of the mean vector, circular standard deviation and 95% and 99% confidence limits. There are also a number of single sample distribution tests, such as Rayleigh’s test of uniformity and Rao’s spacing test. Samples can be compared with various tests such as Watson-Williams test or Mardia-Watson-Wheeler test. Intersample correlations can also be calculated. A full list of analyses can be found here. The results of the analyses are presented in a tabular format, ready for pasting directly into your word processor for a report or manuscript. The number of variables and cases that Oriana can analyze is only limited by the amount of installed memory and disk space (up to 2 billion maximum). A variety of graph types are available in Oriana. 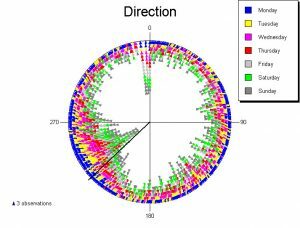 The data for each set of observations can be summarized with rose diagrams or circular histograms. 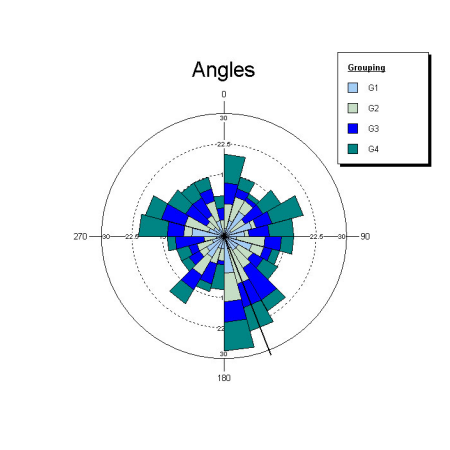 The rose diagram/histogram bars can be stacked to show the relative proportions of subsets within the data. 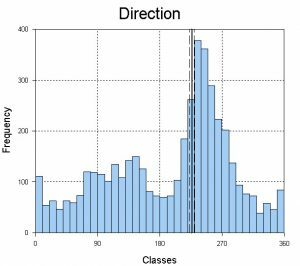 Linear histograms can also be plotted. 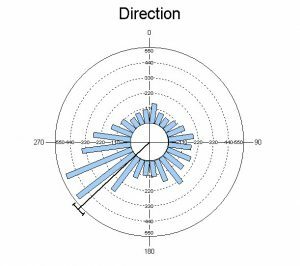 Linear data can be incorporated into two variable rose diagrams or histograms as well as in vector plots, where an arrow or bar is drawn for each case, with the length representing the linear data, and circular scatterplots. Individual observations can be shown in raw data plots. 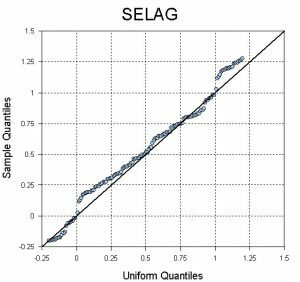 Distribution plots allow you to assess whether the data depart from a uniform or von Mises distribution. The distributions of two sets of observations can also be compared with Q-Q plots, and regular scattergrams can also be produced. Various aspects of the appearance of the graph can be modified, including fonts, colors of lines, objects and background, and text of titles and axis labels. When the graphs are ready you can print them to any Windows printer, save to various graphic formats, or copy and paste them to any other Windows application. Full details of the graphics capabilities can be found here. Oriana can natively handle a wide variety of data types. Oriana calculates a variety of single sample statistics as well as inter-sample comparisons. A variety of graph types are available in Oriana. See what's new in Oriana v.4. What are the system requirements for Oriana? Oriana is delivered electronically. Please allow up to 24 business hours to receive download instructions.